Of course my favorite Sabbath album. Dio is easily a more capable and technically gifted vocalist than Ozzy. The songs rock really hard, although Sabbath loses a bit of their doom edge for a clearer more melodic sound. Neon Knights is a rocking opener, but it doesn't do much for me. Perhaps I am biased against pure hard rock. But the song does well enough, and Dio's vocals make me like it a bit more than Paranoid. Children of the Sea is quite epic. Powerful metal. With the soft intro, and Dio's entrancing vocals, possibly my favorite song, here. Oh wait, I am not even past the second song. This song is ferocious, and The operatic Dio slams into your head with goose bump evoking brilliance. Did I mention the ripping solo? the song has some progressive leanings, and the eerie synthesizers I hear in the background are wonderful touches to this classic. Lady Evil comes after. Thumping bass line, and all. This is another more commercial song, but with fancy guitar slinging action via Iommi. A dark hard rock song, but the lyrics take a hit. Memorable, heavy, thick, and strong, but not amazing. The writing for this song is plain and simple, although the playing and execution keep it form being boring. Wishing Well is more quick and upbeat. This sounds like something you'd hear on Dio's first releases. Power/melodic metal. I can see why die hard original fans of Sabbath might dismiss the Dio years (and anything else Sabbath did), but I don't see why they could so easily overlook so many good songs. Although Wishing Well has to be the song I like least on the album. It is so generic and Dio doesn't seem to shine for me on this on. A decent enough song, thought. Die Young is strong and melodic. Dio roars on here, and it goes between quiet atmospherics to blistering heavy rock attacks. Again, the solo is fantastic. I enjoy the synthesizer work in the background. It adds a nice touch to the song, and to the overall diversity of the album. Walk away follows the suit of the rest of the album, in its heavy blues rock/metal approach. Dio's vocals soar, the guitars dance, the drumming is solid, and the lyrics don't offend (but they could be much better). Nothing to complain about, but nothing to be amazed by. Lonely is the Word ends the album on a strong note. the funky and melodic power rock is pleasing to the ears. The it turns into Tony's strutting ground, for an amazing inspired solo. The light synth in the background to a solo that feels straight out of a Pink Floyd (later years) song. Magnificent close. 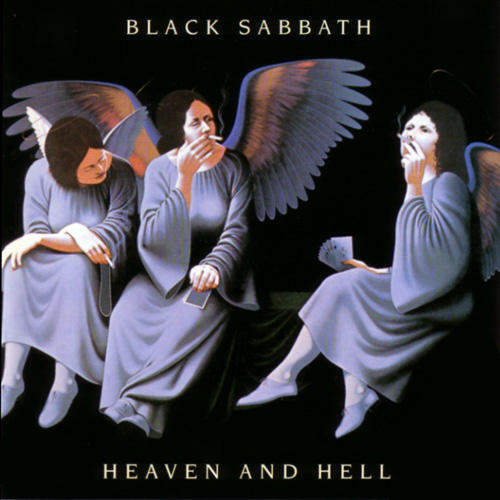 In all, the album revitalized Black Sabbath, and did wonders for melodic metal. The title track being evocative and masterful. The album suffers from some same sounding songs, lack of progression, and a few lyrical dips, Excellent addition, and essential to power metal/melodic metal fans. Four Stars.